Artisology Round Confetti Balloons will look perfect at your upcoming baby shower, bridal, Sweet 16, princess party, or any other party really. Artisology Balloons are great for parties but can also be a perfect gift companion. Imagine receiving a gift with these balloons attached. ROUND SHAPE --- our balloons when inflated to 36 inches in diameter will inflate to a spherical shape, NOT OVAL shape like other Balloons on the market. DO NOT BE MISLED as some sellers say round but balloons are really OVAL. HASSLE FREE --- unlike other Confetti Balloons on the market, Artisology Confetti Balloons come with confetti already inside the balloons to make the process as easy and efficient as possible. We understand you value your time and this should easily save you 5-10 minutes and you will not spill the confetti as it normally happens when its a DIY confetti balloon. CLEAR MATERIAL --- these stunning Balloons come in a see-through latex material that is sure to boost the aesthetic of any Birthday Party, Baby shower, Bridal Shower, bat mitzvah, or Wedding. Great for any celebratory occasion really! 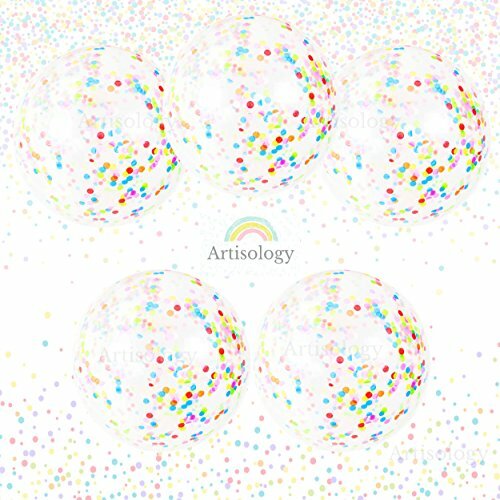 UNIQUE COLOR --- Artisology uses a unique color combination of two shades of Blue and a white color of confetti. This color combination is sure to go well with almost any party theme you decide to go with. QUALITY --- we understand you need a reliable product and it is only fair to provide quality Balloons when you want Clear Confetti Balloons. Be assured you are receiving quality with Artisology. If you have any questions about this product by Artisology, contact us by completing and submitting the form below. If you are looking for a specif part number, please include it with your message.